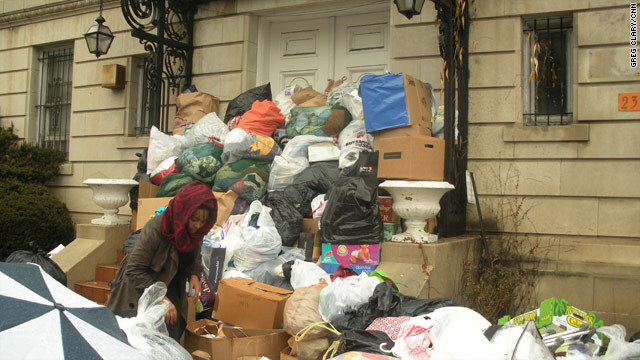 Donations pile up outside the Haitian embassy in Washington after a survival kit drive on January 17, 2010. London, England (CNN) -- Earthquake-devastated Haitians need donations of cash -- not clothes, food, medicine, or other relief supplies, as well intended as they might be, aid groups said Thursday. Such "in-kind" donations can at best take up valuable space in cargo shipments and waste aid workers' time in sorting through the items, charities said. At worst, the food or medicine could be unusable or even dangerous. "Sending donated goods oversees is an appealing idea because it makes you feel like you're really helping while at the same time recycling things that are no longer of any use to you," writes former aid worker Saundra Schimmelpfennig in her blog about the impact of aid. "Unfortunately inappropriate donations can do more harm than good and it often costs more to ship used goods than to buy new goods locally." Schimmelpfennig has worked for the Red Cross and describes herself as a leading expert in the 2004 post-tsunami recovery efforts in Thailand, where she says she saw the impact of aid from the perspectives of donors, villagers and aid workers. Her blog, "Good Intentions are Not Enough," explains why cash donations are often much better than sending goods to a disaster-stricken area. In a list of the "Dos and Don'ts of Disaster Donations," Schimmelpfennig explains that "after the tsunami tons of used clothing were donated, much of it inappropriate to the climate and culture." They included winter hats, coats and gloves. "Donated goods can also clog ports, preventing more immediate relief items from getting through," she writes. "Ports can only hold and process so many goods and often the port authorities have difficulty sorting through everything arriving to get it processed and out the doors." Many of the items people want to donate -- such as blankets, shoes, food and even medicine -- can be bought locally or regionally, said Florian Westphal of the International Committee of the Red Cross. Doing that cuts down on the cost of transporting the items to the disaster zone, and helps put money into the local economy, he said. Such is the case in Haiti, said Matt Wingate, a senior emergencies adviser for Save the Children in London. There are parts of the island that were relatively unaffected by the earthquake, and there was virtually no damage in neighboring Dominican Republic. "Materials that are available locally, either in Haiti or on the island within the Dominican Republic, are better purchased locally because of the very obvious transport cost, which can often dwarf the cost of the materials many times over," Wingate told CNN. Schimmelpfennig described how, after the Asian tsunami, a group of students shipped donated school supplies to Thailand. It cost more to clear customs and ship the items to the affected area than it would have cost to buy them at the local marketplace, she said. Donations of goods can sometimes waste valuable time on the ground. After Hurricane Mitch hit Central America in 1998, 15 pallets of "random medicine" was sent to the region, but "critical time was wasted sorting through the medicine and throwing three-quarters of it away," Schimmelpfennig said. Baby formula -- another popular donated item -- can be unnecessary if a community only breastfeeds their children. It could also be dangerous if the formula is mixed with contaminated water. By the same token, medicine can be unnecessary and even harmful. "In practically every country there will be Ministry of Health protocols, government regulations, about the use of drugs. Those are going to be applied throughout the health system that you're trying to support," Westphal said. "It's much easier based on that knowledge, based on the information you receive about what's really needed, to actually buy the right kind of drugs and medical equipment rather than having it sent out." All drug donations should be based on an expressed need, according to World Health Organization guidelines. If they don't match the need, the risk is that the donations will have to be thrown away. "What do you do with hundreds of pounds of unusable drugs?" asks Schimmelpfennig. "Do you throw them out and risk garbage sorters taking them out and selling them on the street to kids? Do you flush them down the sink which risks the drugs getting into the ground water?" The WHO also recommends that all drugs be labeled in a language easily understood by those in the destination country. "While well intentioned, these donations could cause more harm than good if the wrong medicine or the wrong dosage is prescribed due to language barriers," Schimmelpfennig says. Aid groups say they don't want to quash those good intentions, but they want donors to realize why cash is so much better than goods in-kind. "What you really want to be doing as much as possible is actually address the real needs of people on the ground," Westphal said. "That's got to be the priority, and obviously cash gives you much more flexibility in terms of making sure that relief items you provide really correspond to what people need and what people are used to." Charities and aid groups often know the situation in the disaster zone and can make the best assessments of what people need, Westphal said. The U.S.-based Center for International Disaster Information, which promotes education about disaster response, says financial contributions entail no transportation cost and are the most flexible. "Changes in conditions often cause changes in the victims' urgent needs," the group said. "Relief organizations can't convert a used clothing donation into medicine, for instance." Save the Children often groups cash donations together, enabling the charity to save money by buying in bulk, Wingate said. "Often, if not always, gifts are made with the best possible intention, and generosity shouldn't be underestimated at all," he said. "But people after an emergency don't just need anything -- they need specific items. They don't just need any old rubbish. These are people that need to be treated with dignity, and we need to make sure that they're given what they need."